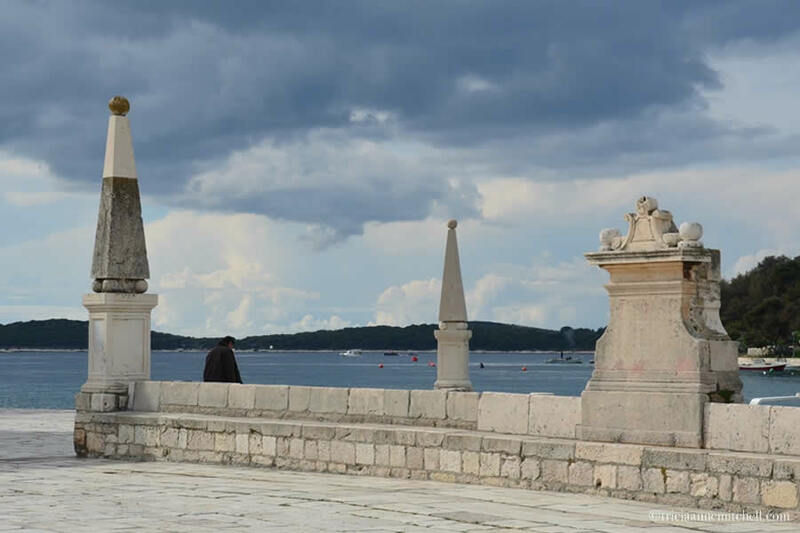 Commanding a strategic location in the Adriatic Sea, Hvar has been an important trading point for millennia. In the late 4th century, Ancient Greeks established Faros, a colony where tranquil Stari Grad is located today. (Faros means ‘lighthouse’ in Greek.) The Illyrians, Venetian and Austrian Empires, Romans and Slavs also left their mark. But Hvar did not solely become known for its geography. It also gained a reputation for producing wine, lavender and rosemary. As the island grew more prosperous, so too did its number of elegant palaces, and buildings intended for all residents’ use, including one of Europe’s first public theaters. On the northern side of the island is Stari Grad (which translates to ‘Old Town’ in Croatian), a place that I can only describe as magical. 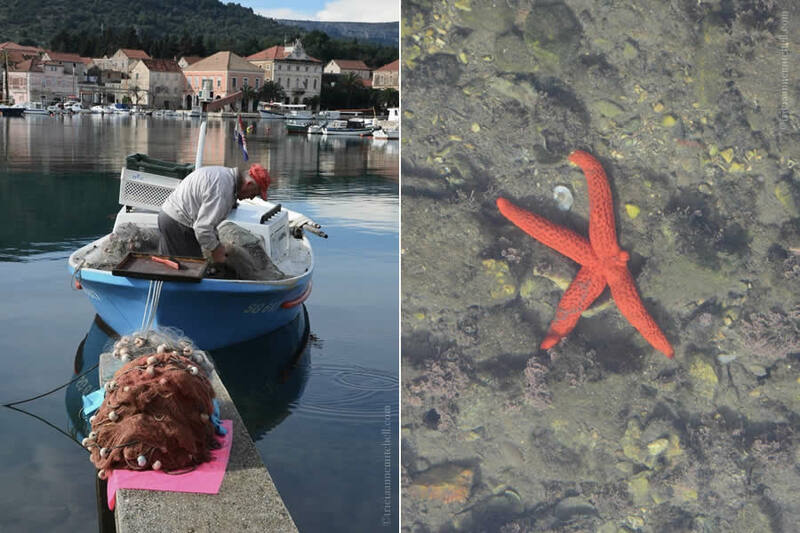 Depending on the time of day, we spied fishermen untangling their nets, schools of fish darting in the calm harbor, and the odd, fire-orange starfish lounging below the surface of the calm water. Cats lounged on stone walls, peeked out of weathered doors, and wound through the flourishes of iron balconies as if doing the slalom. It was blissfully quiet. Locals harvested lemons and clementines from their backyard gardens, and we foraged for wild asparagus in a park, bringing to mind a special afternoon spent with Croatian friends one year earlier. Framing it all was a skyline of limestone buildings, some painted in grapefruit hues, others a delicate lemon chiffon. We tried to imagine what the village’s bay looked like nearly 2,400 years earlier when it was was settled by the Greeks, concluding that it probably hadn’t changed much over the millennia. As we sat along the turquoise water’s edge in elegant Hvar Town, our socked feet dangling over the crystalline Adriatic, we watched as small black fish flitted by below us, tempting us to take a dip ourselves. A group of schoolboys chased each other on the palm tree-lined promenade, as fishermen readied their boats for an early-evening catch. We wandered along alleyways that were eerily quiet for such a picturesque place, continuing up towards the Spanish Fortress (Tvrđava Španjola), along a hilly path bordered by agave and cactus plants. 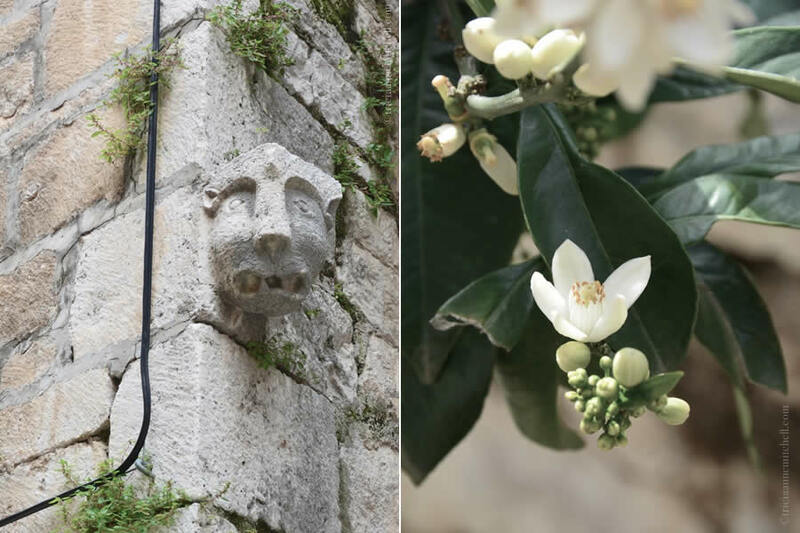 Discovering that the fortress was closed, we sat under a crest of the Winged Lion of St. Mark, reminding us of Hvar’s former ties with the Venetian Empire. From our quiet perch, we saw the Cathedral of St. Stephen and Pjaca (town square) in miniature, as several small boats defied grey skies, setting out for the open sea. 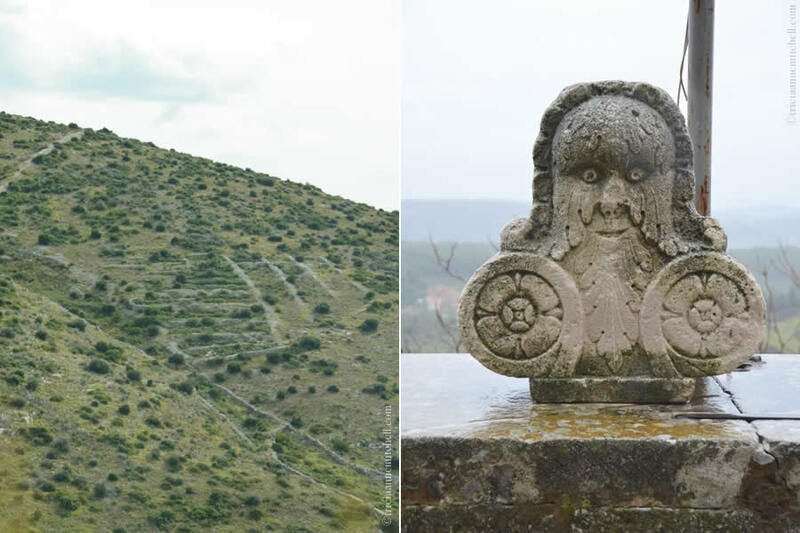 A chameleon played hide and seek from his home in the crack of the fortress, and the town’s centuries-old walls cut through the hilly landscape below, their battlements resembling a set of uniform teeth. 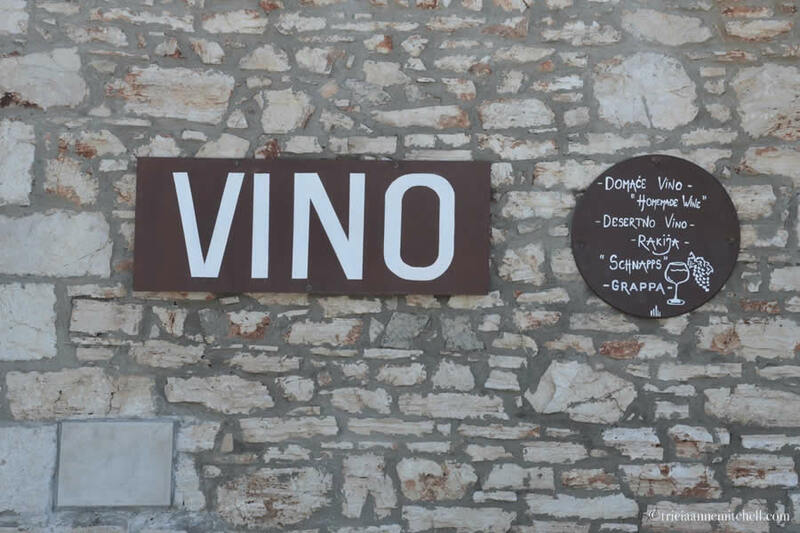 When rains were at their strongest, we sought refuge in the wineries and homes of Hvar natives Tonči, Dinko, and Lenko. Through our friend, Srdjan, a wine tour entrepreneur friend from Split, we met Hvar winemaker and engineer Tonči. He drove us through the UNESCO World Heritage-listed Stari Grad Plain, as raindrops pummeled onto his car’s windshield. Through the water droplets, we could vaguely make out the ancient stone walls of the Stari Grad Plain. Established nearly 2,400 years ago by the Greeks, it is a fantastic example of historical land division. Grapes and olives are still grown there, just as they have been for millennia, but some plots have long ago been abandoned. 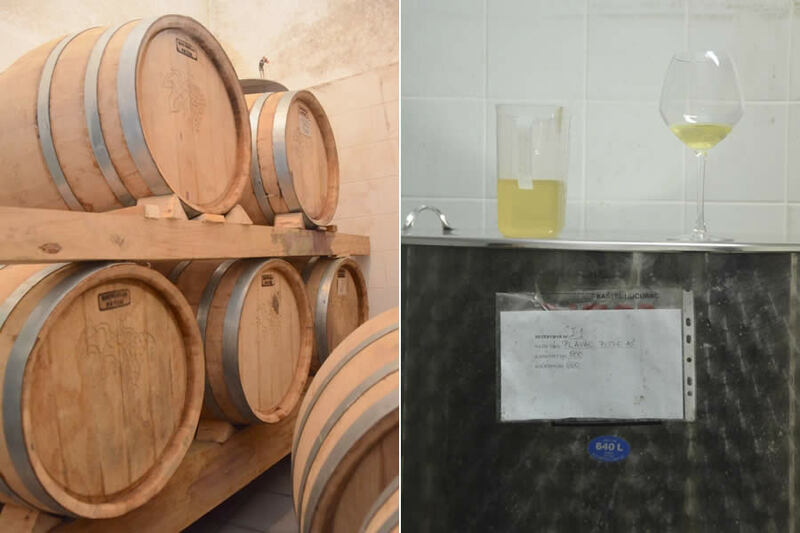 Tonči implements innovative winemaking techniques into his small lots of premium wine, which are numbered, and bottled under the names Pitve Eko and Vron Bod. 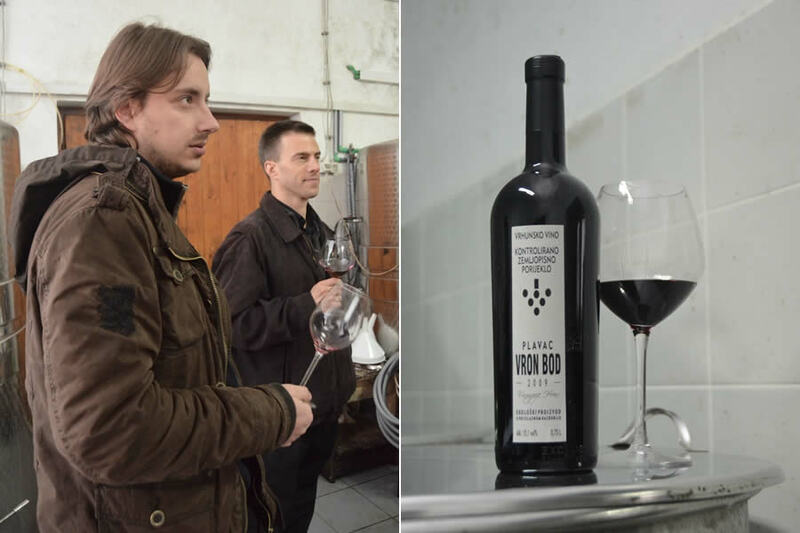 What was particularly enjoyable about spending the day with Tonči, aside from the exceptional wine that we tried with him, is that he’s only in the early stages of commercial wine production. His winery, which he purchased four years ago, is currently undergoing renovation. It’s housed in a former lavender oil factory in Pitve, the village in which Tonči was born. All of Tonči’s grapes are hand-picked, with some aged in Slavonian oak barrels. “Friends with whom I’m distantly related also help pick grapes. They’re good tasters too,” he joked. Starting with enticing white wines made from the Bogdanuša and Posip grapes, we graduated to a series of Plavac Mali wine. (Plavac Mali is a cross between Zinfandel and Dobričić grapes.) The flavors and complexity of the wines, from glass to glass, heightened into a crescendo of Tonči’s 2010 Plavac Mali. To make it, Tonči broke the grape branches and let them dry in the sun, creating an alcohol packed-wine (nearly 17%!) with subtle strawberry-jam notes. The copper-rimmed beauty was exemplary! Shawn and I have started to hypothesize that sometimes engineers make the best wine, a theory that was born at the winery of an engineer in Santorini, Greece last spring. Tonči’s fantastic wine and self-described philosophy about winemaking only seemed to support our theory. “It is a science to know which grapes to choose. You can see the handwriting of the winemaker in the grape and in the wine,” he said. 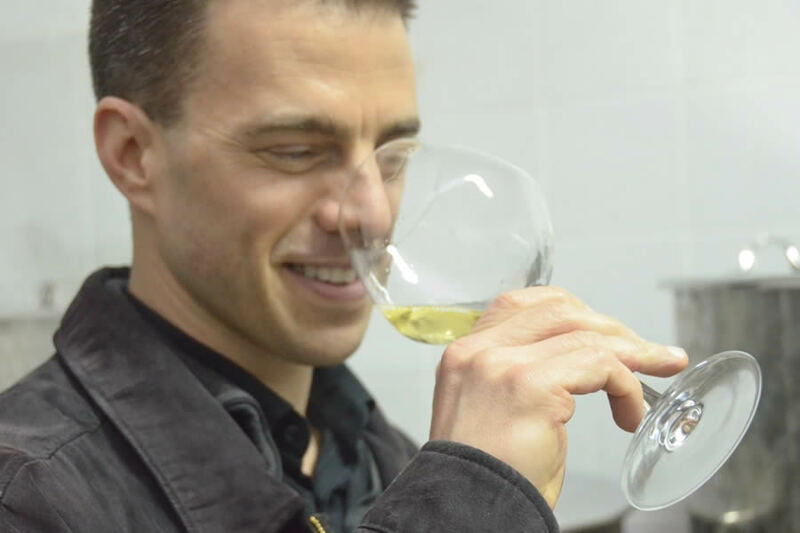 Tonči mentioned that he has a “experimental” winemaking approach, something that he attributes to having learned from winemakers in Italy, even Argentina. 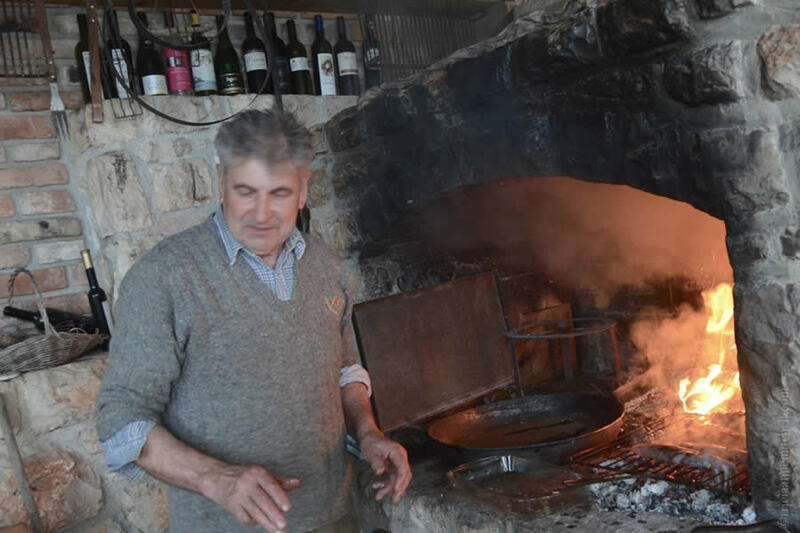 While Shawn, Srdjan, Tonči and I had been visiting Tonči’s winery, on the other side of the island his friends Dinko and Lenko had been whipping up a fantastic Mediterranean spread. 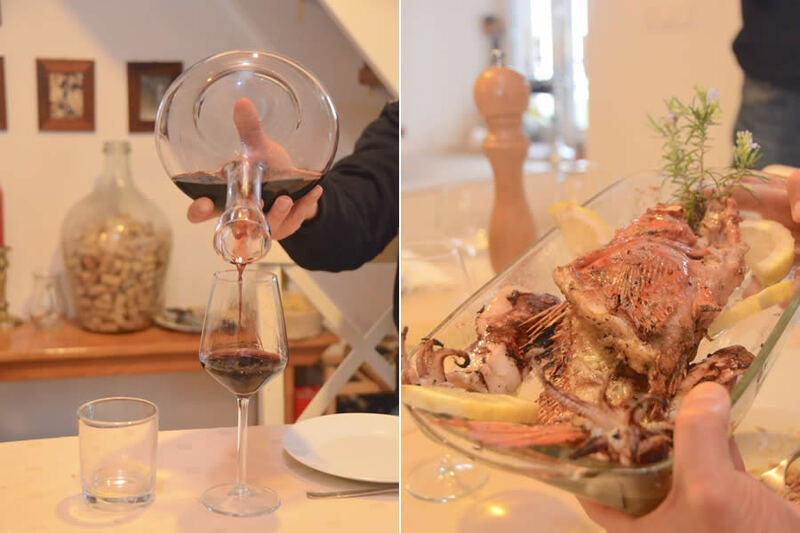 The feast featured Škarpina (red scorpionfish) with lemon and rosemary, caught off the nearby island of Šćedro; a green salad drizzled with Hvar olive oil; and finally, a cuttlefish and squid risotto marinated in vinegar and olive oil. The meal was rounded off with baklava and an apple-creme sponge cake, with Tonči’s fantastic wine vying with the delicious spread for the spotlight. 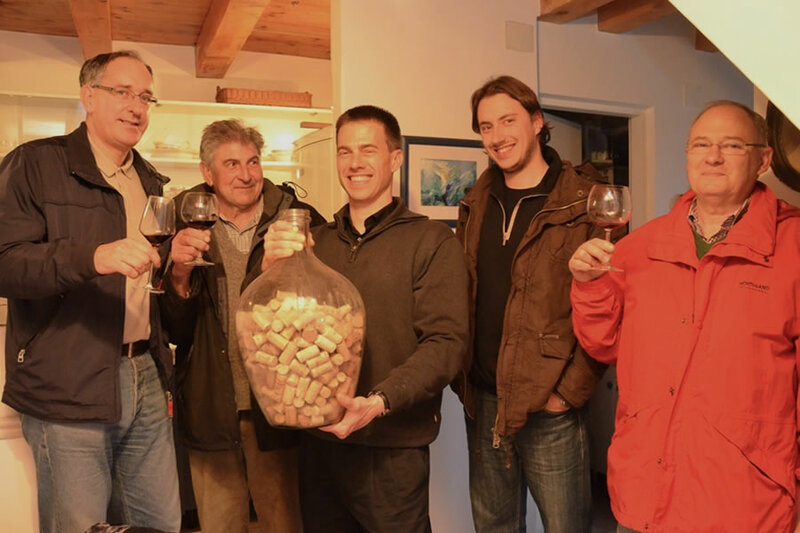 We savored a 2013 Marijan Bogdanuša, a 2012 Marijan Pošip and a 2010 Plavac Mali. When I asked the friends what makes life on Hvar special, the answer was simple. 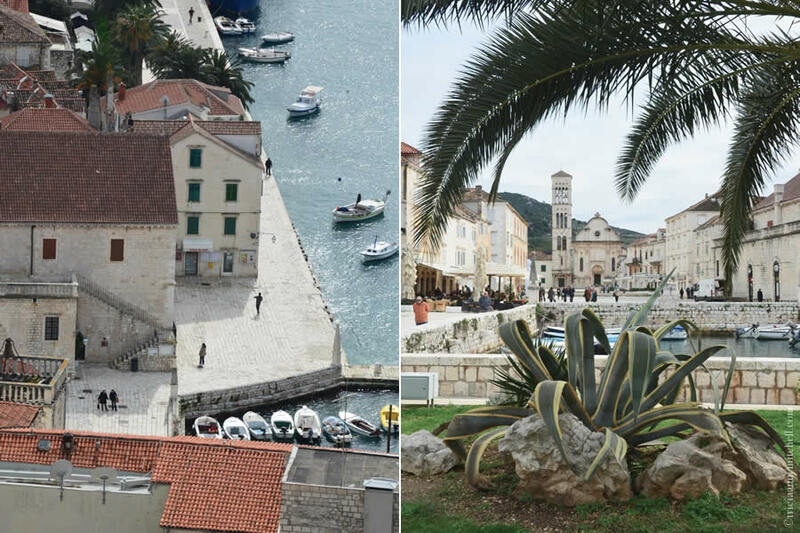 “The roots make Hvar special,” Lenko said. The men then tiptoed into a conversation about the importance of longtime friends, of traditional festivals, and of singing. Before long, Dinko was leading the table in song, with the three men crooning klapa tunes – a kind of a cappella music with themes about home and country, or beautiful women with names like Nicoletta leaving them. “If you don’t know how to sing, you won’t get married on Hvar,” Dinko joked. Before Shawn and I knew it, it was time to go back to bustling Split. As we left Lenko’s house, the song Nicoletta repeated in our minds. Our long weekend on the sleepy island of Hvar had already started to feel like a dream. 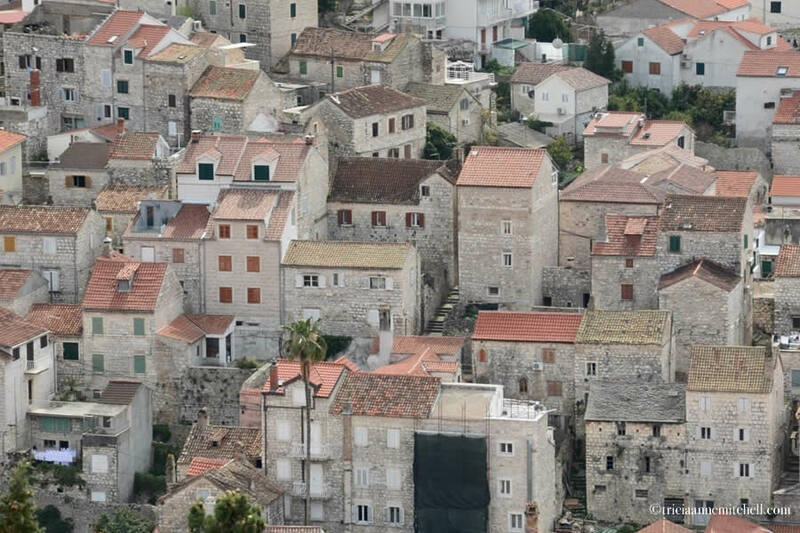 The rooftops of Hvar Town. 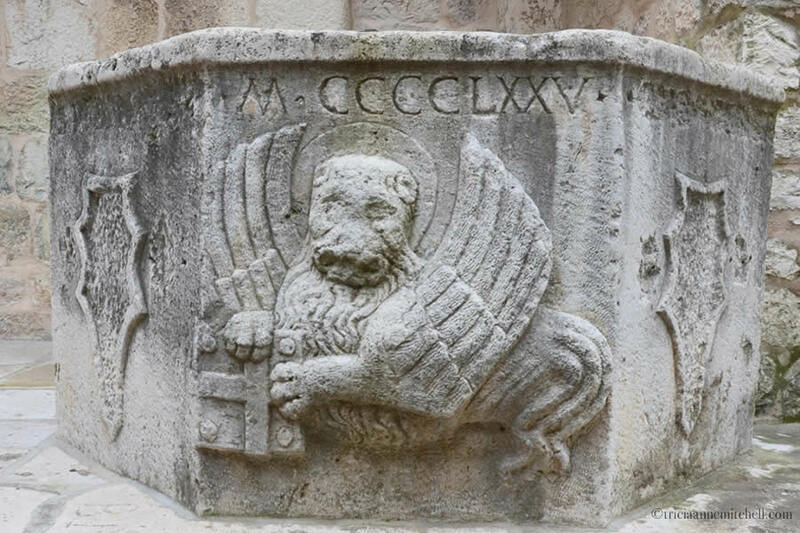 The silhouette of a Winged Lion of St. Mark plaque, which was added to the Spanish Fortress when Hvar was part of the Venetian Empire. On the right, the skeleton of an agave plant is juxtaposed with the Cathedral of St. Stephen. Lavender blooms, even in the early-spring months. A weathered well, dating back to 1475. The Tvrđava Španjola (Spanish Fortress), built in the early 16th century. 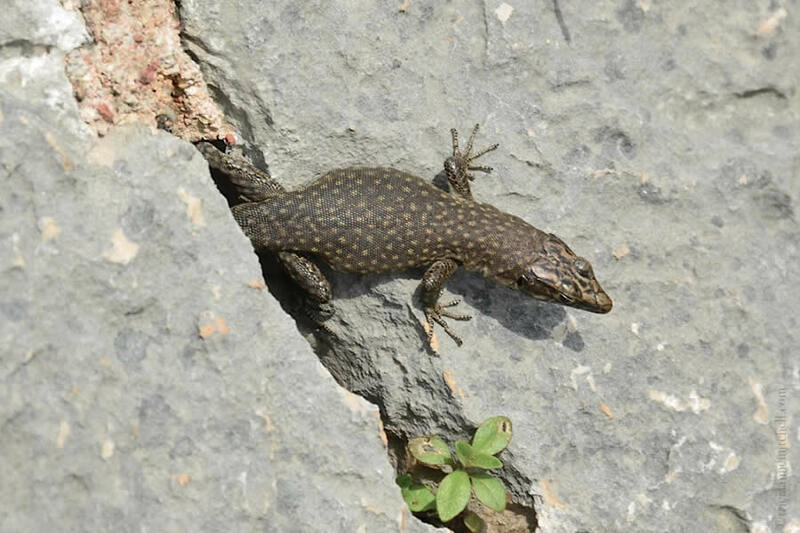 A chameleon calling the Spanish Fortress home, kept us company as we enjoyed a picnic overlooking the Adriatic Sea. Shawn looks out onto the Adriatic with the Spanish Fortress as his perch. 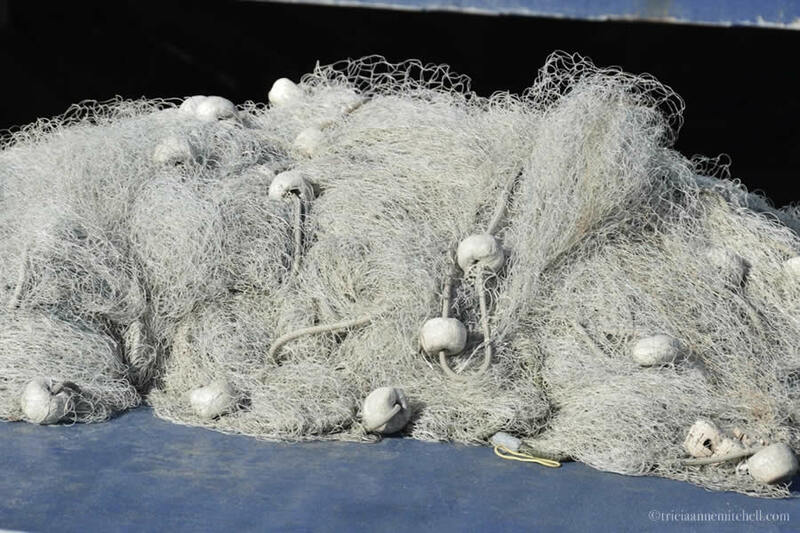 A fisherman untangles his net in Stari Grad’s bay. 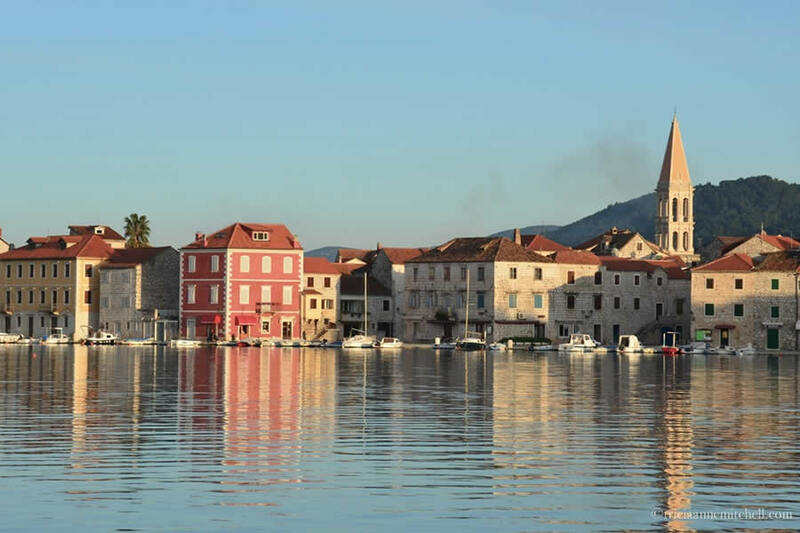 Stari Grad is the oldest town in Croatia with Ancient Greeks settling there in 384 BC. Tranquil Stari Grad by day. Our lovely apartment for the weekend was situated just a moment’s walk away. 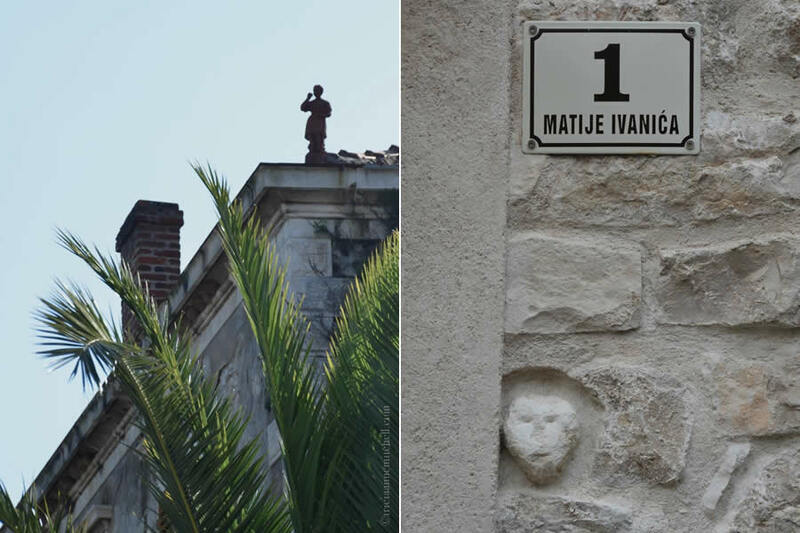 Figures and faces tucked into Stari Grad’s nooks and crannies. 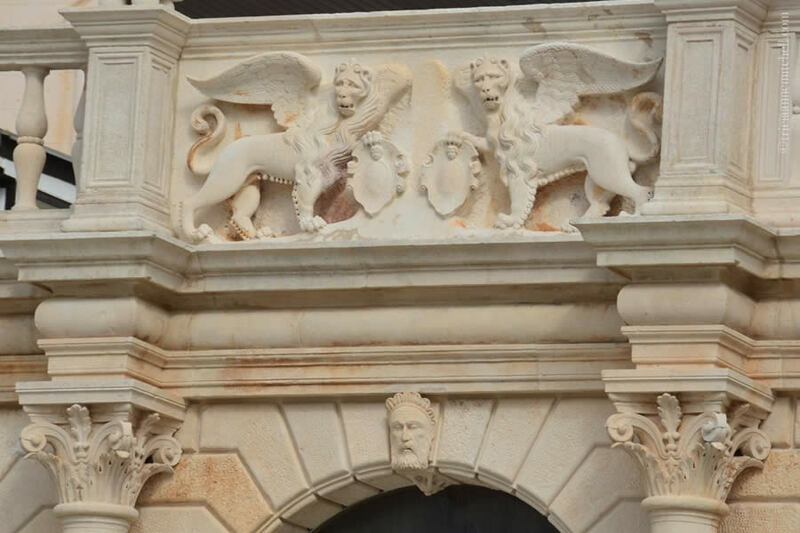 The winged Eros in Stari Grad. The relief dates back to Roman times. Tvrdalj, the summer home of Croatian Renaissance poet and nobleman, Petar Hektorović. He had the villa fortified so that it could shelter Stari Grad residents during Ottoman attacks in the 16th century. Some wings even housed travelers and the poor. Its center was designed to represent the world’s creatures living in the water, air, and on the ground. There was a pond for fish, a house for pigeons, and a garden for land animals. 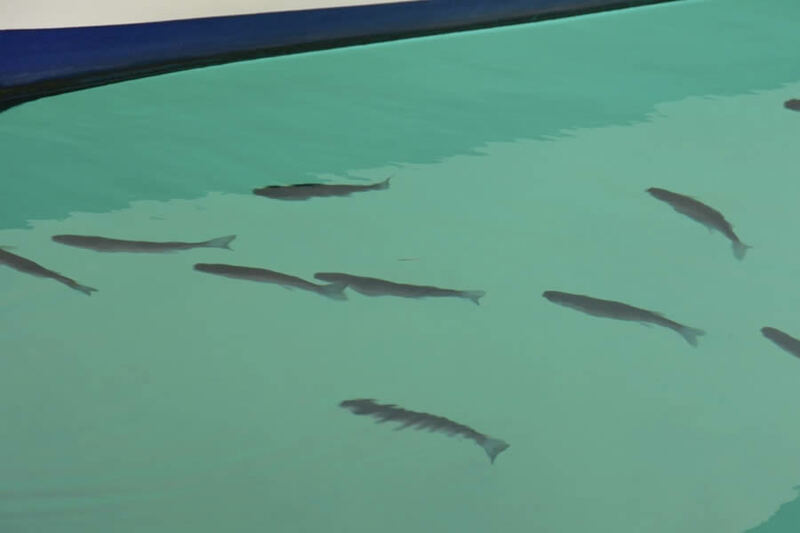 Though the villa is removed from the Adriatic’s edge, a channel connects the villa’s fishpond to the Adriatic, so fish can freely swim. 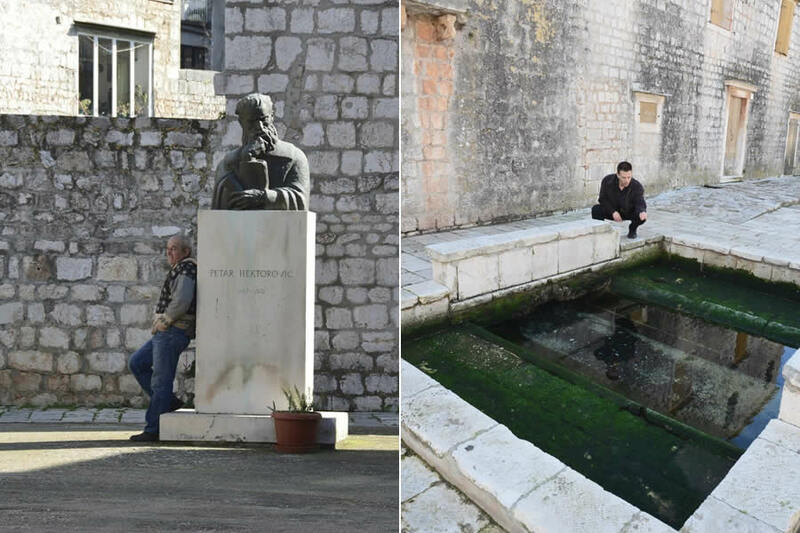 Hektorović’s likeness, and a fish pond outside his villa. Inscriptions on Hektorović’s home reflect his philosophy of life. They’re written in Latin and Croatian. 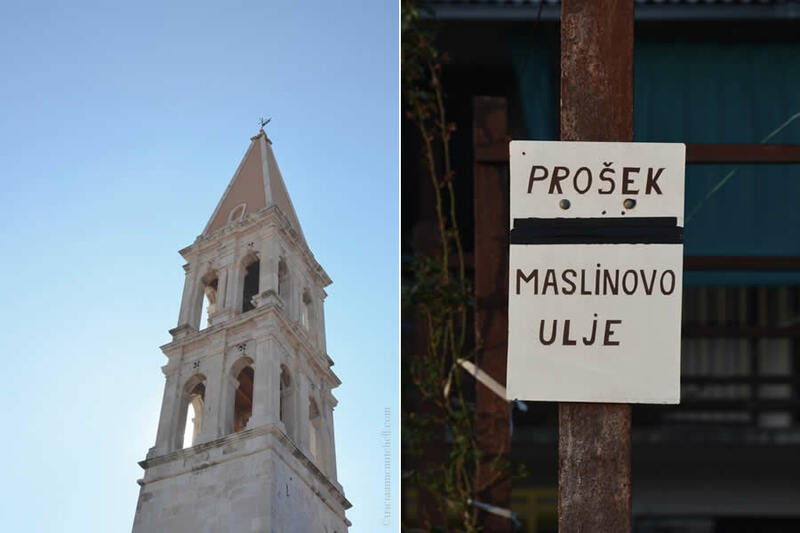 A Stari Grad church steeple, and locals’ signs inviting passersby to buy Prošek (dessert wine) or maslinovo ulje (olive oil). 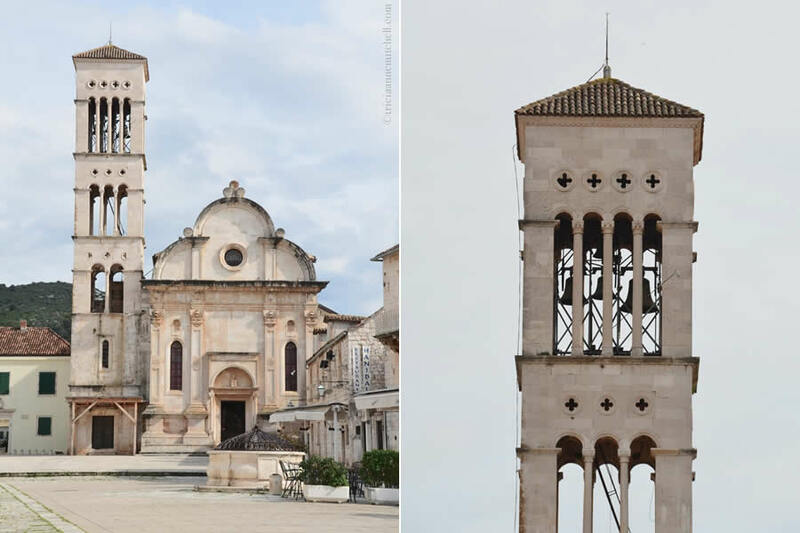 The Cathedral of St. Stephen, Hvar Town. Hvar’s rocky landscape, and an example of land division. 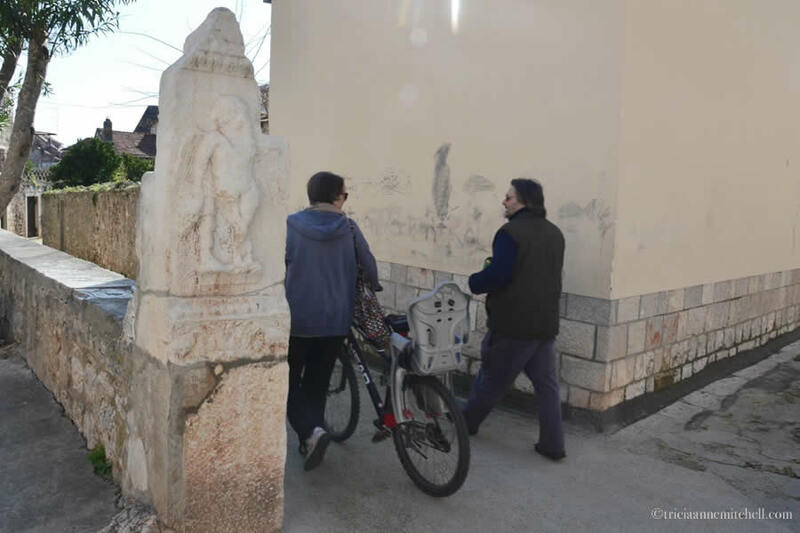 On the right, a stone head of mysterious origins in the village of Pitve. Some have claimed it to have Roman origins, whereas others think it might only be three or four hundred years old. Barrels in Tonči’s winery in the village of Pitve, and a glass of his Posip wine. Our wine entrepreneur friend from Split, Srdjan, dropped by via ferry to meet up with us on the island. Here, he and Shawn await the next Plavac Mali vintage. 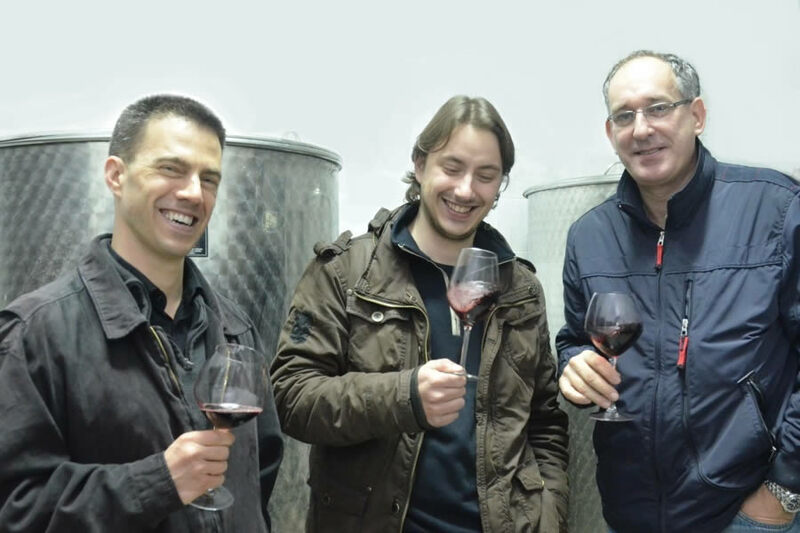 Shawn, Srdjan and Tonči, with glasses of Plavac Mali. Dinko, who whimsically lives between two islands, grills up our lunchtime feast, which includes fish that he’d just caught that day. Tonči’s wine, and red scorpionfish, garnished with lemon and rosemary. 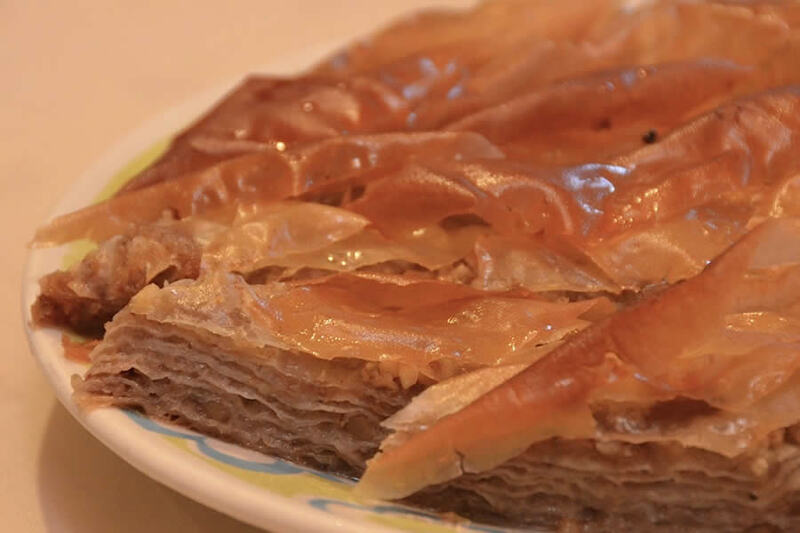 Baklava made with Filo dough, honey, and walnuts. Tonči, Dinko, Shawn, Srdjan and Lenko ham it up for the camera. 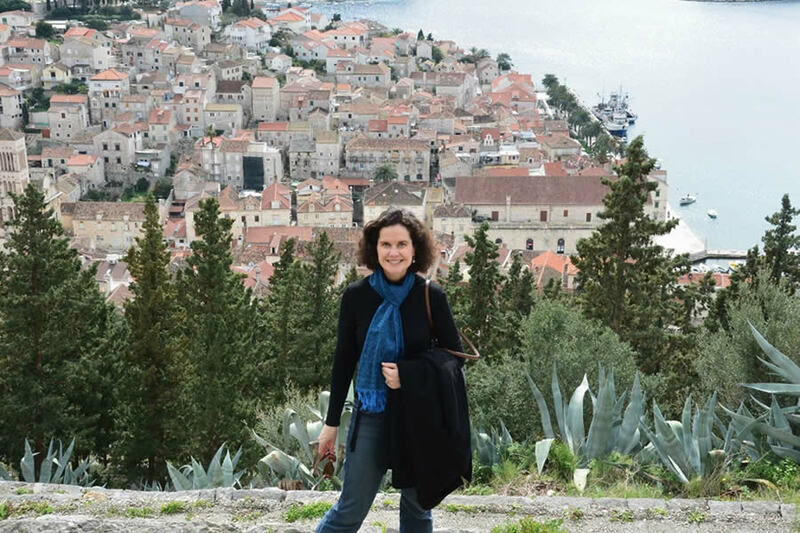 The lifelong friends shared tales of life on Hvar, explaining that different dialects exist between mainland Croatia and Hvar, and even among villages on the island of Hvar. 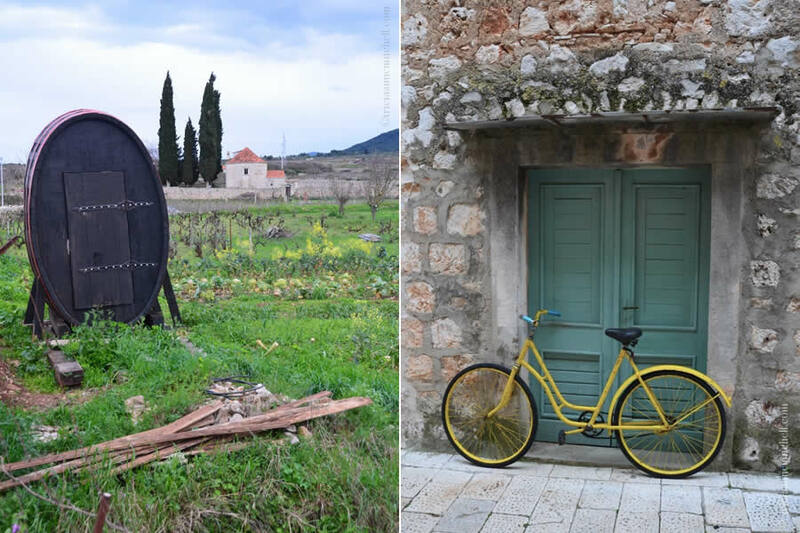 “We (residents from different Hvar villages) can’t understand one another after too much wine,” one joked. 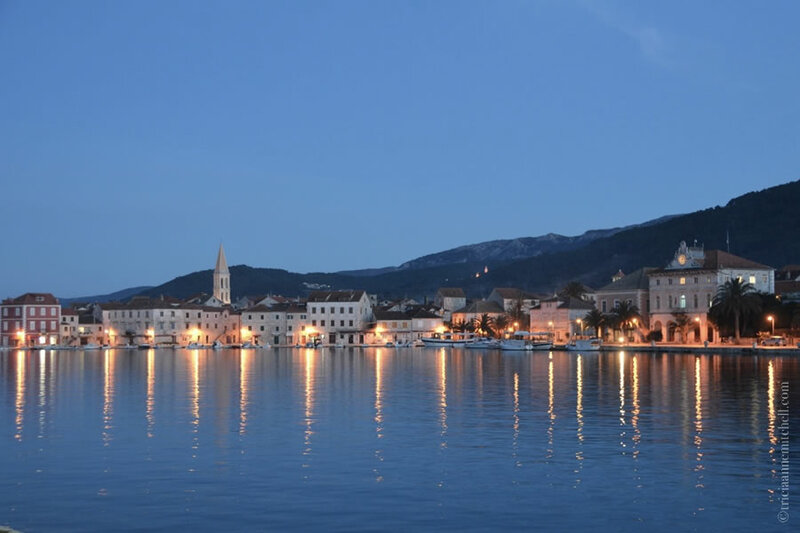 Stari Grad twinkles at twilight. Tonči’s winery is so new that he doesn’t yet have a website. You can find his special wines in select wine boutiques, or coordinate a visit through the Art of Wine, a company which our friend Srdjan owns. The Jadrolinija ferry from Split to Hvar (Stari Grad) took about two hours, and we purchased our tickets directly from a Jadronlinja booth in Split a day in advance. 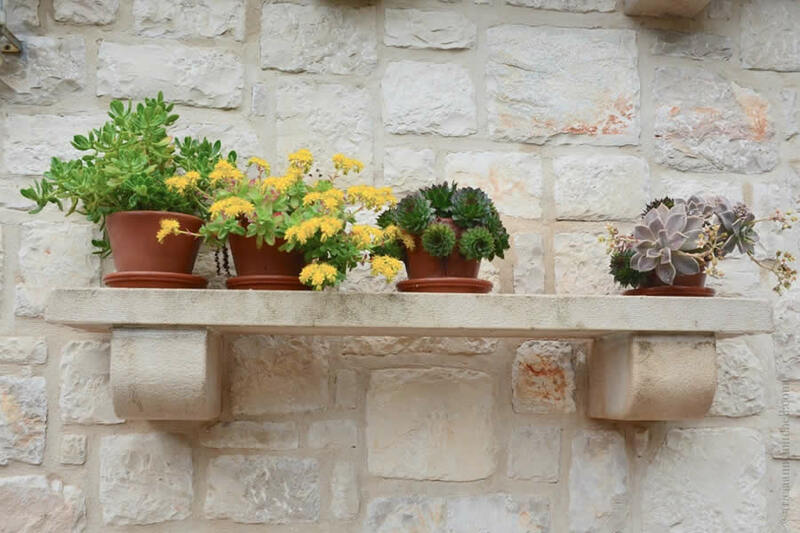 While on Hvar, we stayed at the Apartments Lucija (affiliate link) in Stari Grad. It’s run by down-to-earth Lucija and her family and located at Kneza Branimira br. 5, 21460 Stari Grad. Our simple, but very pleasant apartment overlooked Stari Grad’s placid bay. Kind Lucija even welcomed us with a small basket of clementines and lemons, which she’d picked from her backyard. 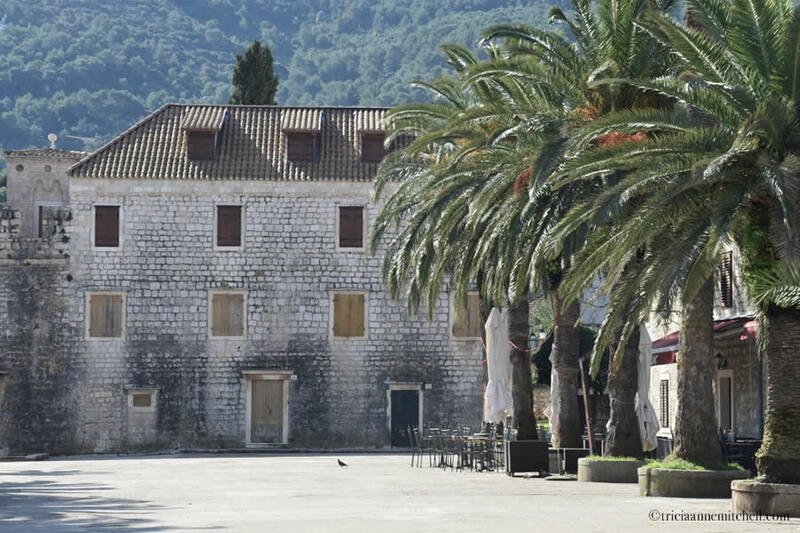 A small chain grocery store, and some family-owned markets can be found in Stari Grad, and also in Hvar Town. If we’d had more time, we also would’ve loved to have purchased some of the fresh catch that local fishermen sold along Stari Grad’s harbor. Hvar’s local buses offered transport between Stari Grad and Hvar Town; view the latest Hvar bus timetable. 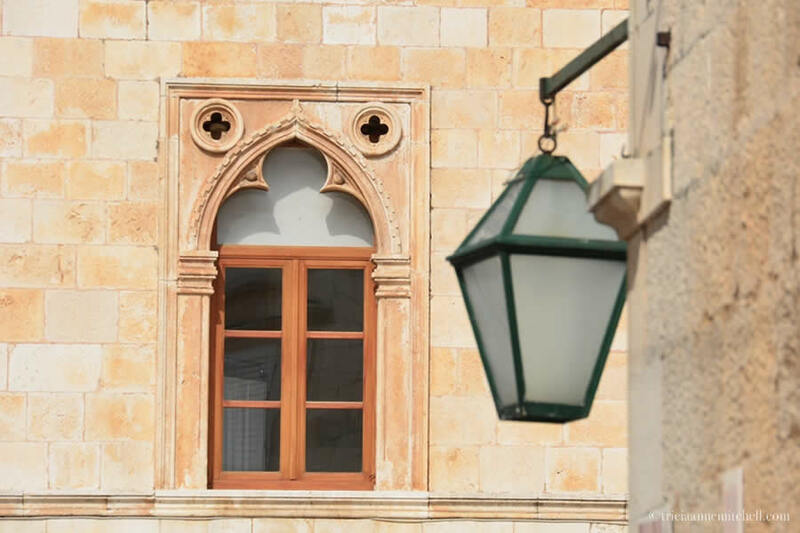 See the Stari Grad and Hvar Town websites for additional details. Photography & text © Tricia A. Mitchell. All Rights Reserved. My husband, Shawn,created the video. 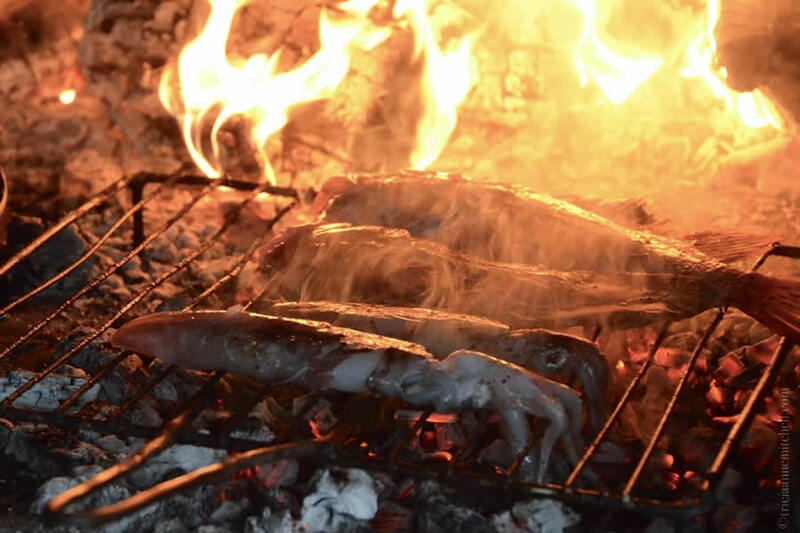 Less than a week left for our Croatia trip….. This post will come in handy! Sonia, you must be so excited! In all, I forgot how long you’ll be there? There’s a small chance we’ll be there in a few weeks too; it’d be fun if our itineraries overlapped. Beautiful video, as a child I was in Hvar, but don’t remember much of it, rather than swimming in the ocean, which was an amazing thing or me back than. Cornelia, I’ll pass along your kind kudos to Shawn, who delights in making our videos. Thank you. Ah, what a treat it’d be to see what Hvar was like back then! Though we didn’t go swimming this time around (some people had just braved the chilly water a month earlier though) I did swim near Dubrovnik years ago, and I remember how strong the waves were. 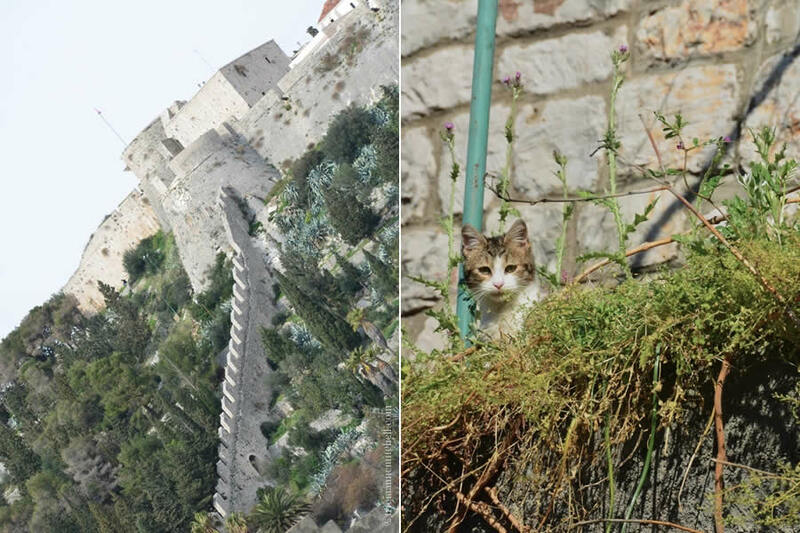 Knowing your love of cats, I think you’d especially appreciate the beautiful cats on on Hvar, and throughout SE Europe. Many, or perhaps most, I suspect, don’t have homes. It’s hard to not resist the urge to pick up the kittens. 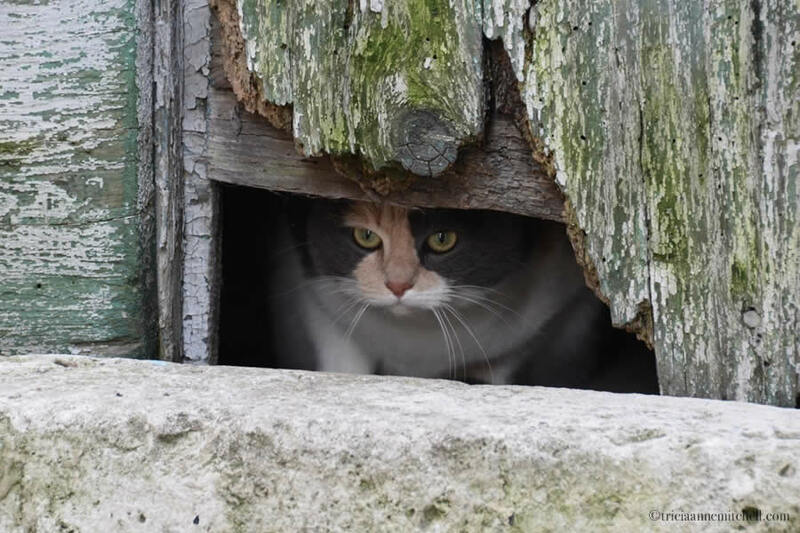 Ah, how sad to know about abandoned cats, always breaks my heart. But I see them here too, but I can’t just adopt all of them, even I would love to. It is a challenge in many parts of the world, Cornelia. Germany, though, does seem to have some of the happiest dogs and cats around. :) How many cats do you have? Tricia, that might be true. Back in Germany I had two cats, than over here in the States, I had two as well, who passed a few years ago. Now after 3 years I have a sweet 3 year old one with just two legs. She steals my heart all the time, her name is Moshu. Cornelia, Moshu is lucky to have such a wonderful home. Does she have a set of wheels to help her get around? “Faster than a jet.” Makes me smile. What a magical place. You pictures make it look so inviting. I love how you tucked in a few cute cat pictures. While I wouldn’t be eager to visit this island in the summer (when prices are high and thousands of tourists come in for the day) being there in the springtime was, as you said it, magical. It has the perfect mix of history (thousands of years of it! ), culture, and tranquil scenes. Looks very tranquil. I think such places are best seen off season, when everything returns to a more normal way of life and you can appreciate scenery and architecture without crowds. Dorothy, we’ve come to the same conclusion. Given how pleasant the weather was in Croatia during the winter months (compared to other parts of the world that don’t have Mediterranean climates) we are actually surprised that more people don’t visit Croatia during the off season. Not only did we have many of the villages ‘to ourselves’ but the prices for accommodations were much more reasonable. Love how they sing and enjoy life. A beautiful location to spend some time in as you did. What month was this? Hi Lynne, theirs is a different pace of life, isn’t it? When we asked one of the gentlemen for his postal address, he simply wrote his name, and the two islands in between which he divides his time. I love their reverence for tradition and lifelong friendship. We visited Hvar back in March. Many locals had told us that the winter had been unseasonably warm, but still, because of its Mediterranean climate, the island is said to never get very cold. It’s renowned for its lavender; I’d love to see that some July, but I’m not sure I’d want to battle the crowds. Another great post, thanks Tricia, love the way you always get wine and food into your posts, keep it up. 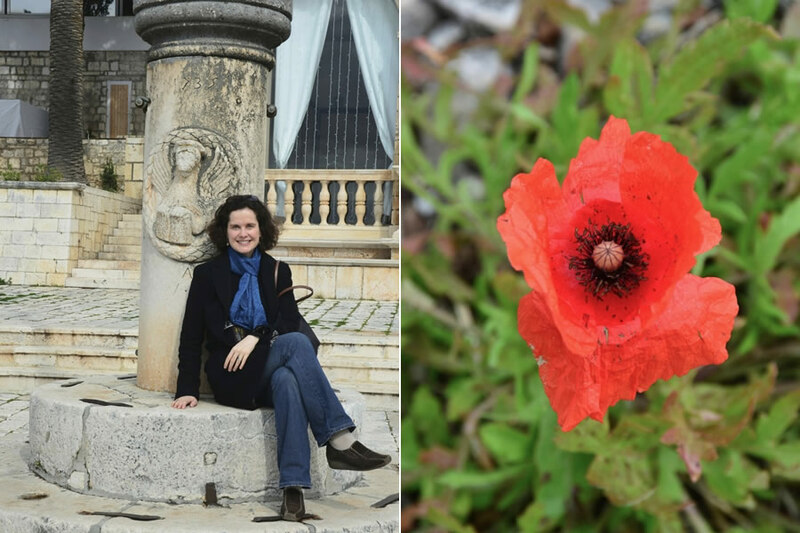 I had no idea that Hvar had so many influences: Greek, Spanish, Roman, Venetian…! How busily different it must have been from the sleepy town today which you show in your photos and video. It certainly has an incredible amount of history plus UNESCO-recognized sites and culture. 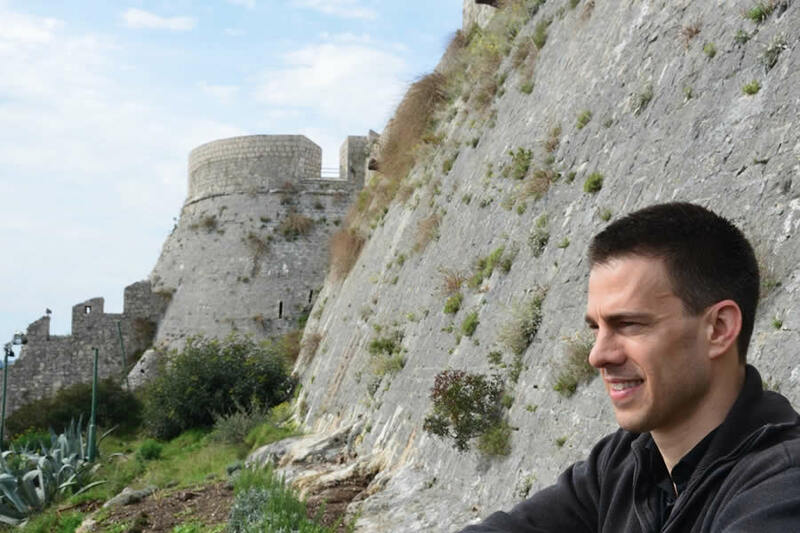 Even klapa (acapella music) and its Mediterranean diet are protected by UNESCO. It looks amazing! I particularly like your photos of cats! Ha ha. We have not yet been to South America, but hope to get there in the near future. Do you live in Argentinian wine country? I’ve never been to Hvar, but just loved Croatia when we last visited! Looks lie you had such a wonderful time! I especially love the last picture by the water — so pretty — and I appreciate your maps at the bottom! Hi Neely, historic Stari Grad has become one of my favorites in Europe. Scenes like the one that you mentioned are the culprit, plus the history is intriguing. 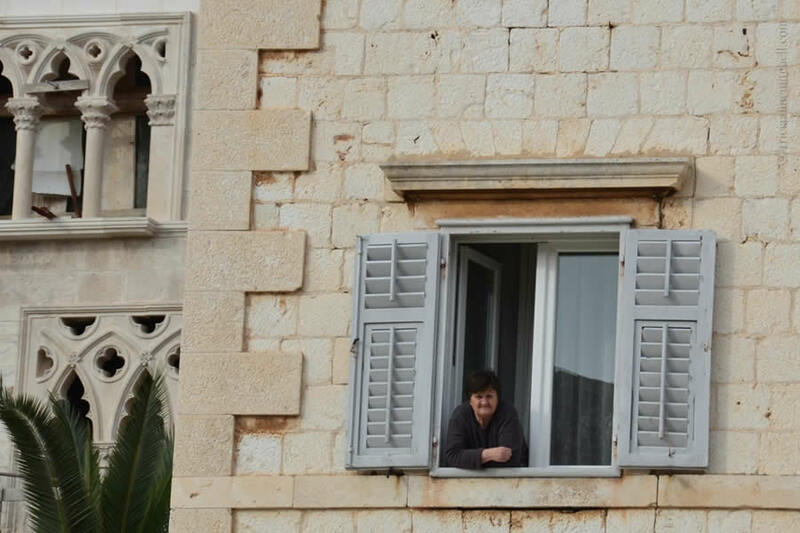 I remember that you visited Split previously… the next time you’re there, Hvar is only a short ferry ride away. :) Until then, thanks for dropping by and for enjoying a virtual visit. 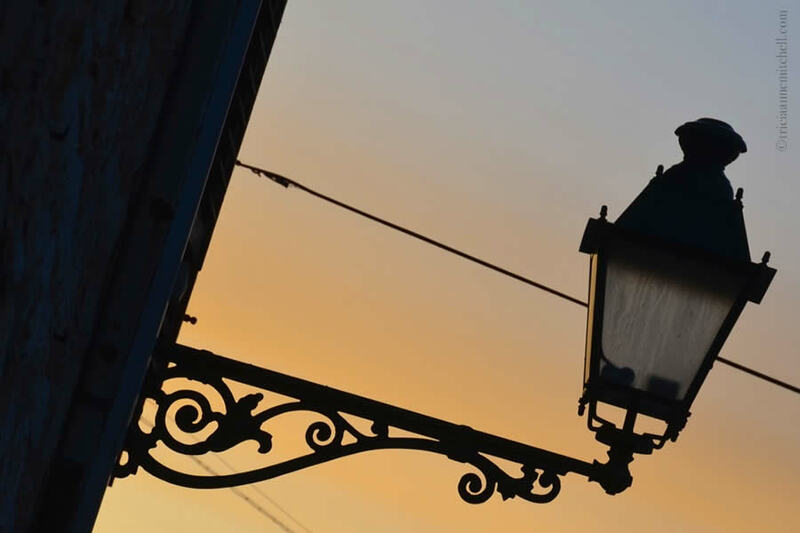 Music, history and wine…beautiful place and you capture them all in your write-up and photos. 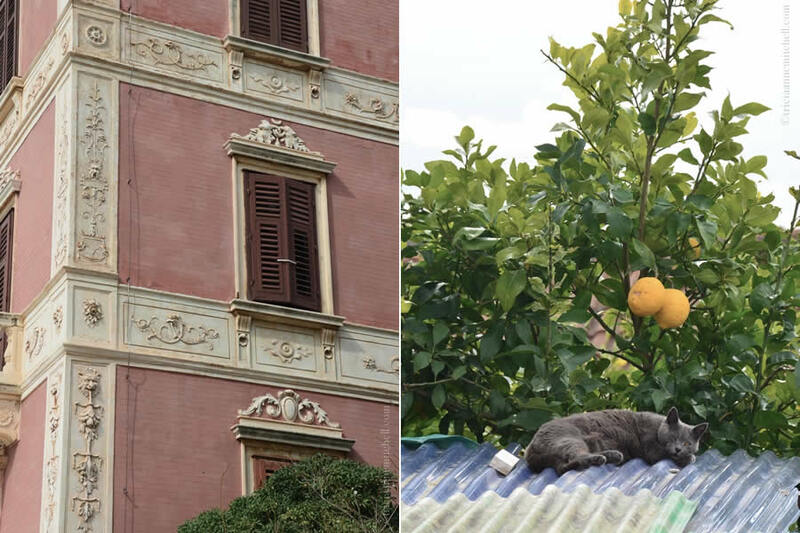 The two photos of the cats are tremendous, really well done (framing and lighting), although my favorite shot is the “Tranquil Stari Grad” something peaceful and a place I could linger all morning. Cheers! Stari Grad became our favorite spot on the island, though I suspect some of the other quiet villages could have easily reeled us in as well. We’ve been to some gorgeous places of the world where the locals have the ‘grass is greener’ syndrome. Here, however, the residents we met seemed to be quite content with their surroundings. Another great location…another great collection of great photos. Would agree that it would be great to sit up top the fortress and take in the scene over a morning coffee. Beautiful travels, and a couple of my good friends are just leaving to visit Croatia, and had them check out all your posts :-) Cheers! Randall, sounds as if everyone’s tempting you to go to Croatia these days! I appreciate you referring your friends to my tales – here’s hoping they’ll prove to be useful. Also, I’m happy to help, should they have any questions. Jo, he looks utterly content, doesn’t he? He keeps saying it’s one of his favorite places in the world (mine too!) and how not with friendly people, beautiful scenery, good wine, and the sea. Thanks for stopping by and wishing you a sunshine-filled day! 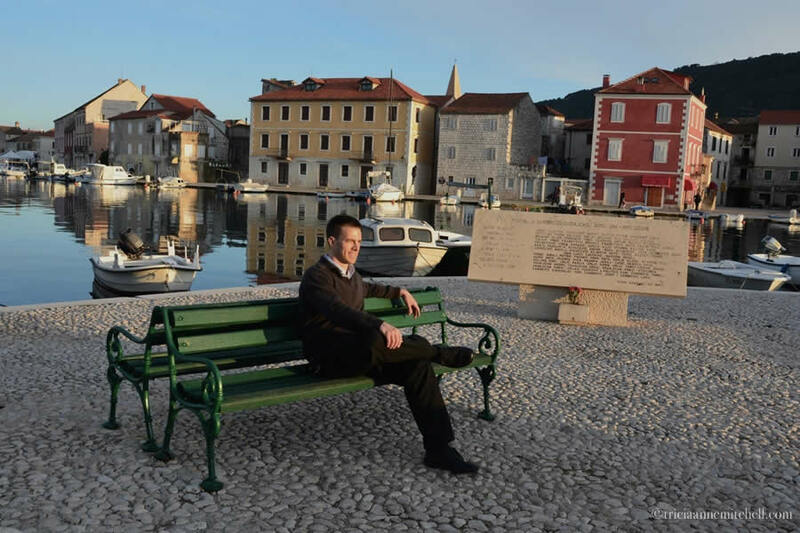 Lucre, Stari Grad is special regardless, but how neat that you have a familial tie to such a pretty, peaceful place! I’m flattered that you’ve shared some of our Hvar experiences with your family and readers. Gracias! Do you speak a bit of Croatian? It would be fascinating to hear your grandparents’ story, and how they came to live in South America. On a side note, my husband and I are eager to visit Argentina someday, as we’ve read that it’s a beautiful country. In what part of Argentina do you live?